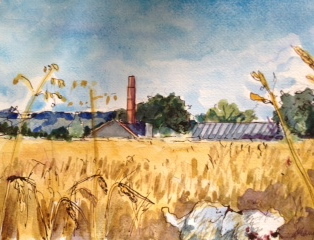 Sally Muir is leading a group of fellow artists to produce a display of South Stoke plateau-inspired artworks that will be displayed at various locations. They are aiming to generate further interest and support for our campaign to save the stunning landscape on the southern edge of Bath from a housing estate of more than 300 homes. The exhibition will be staged at Green Park Station on Saturday 17th August (Farmers' Market Day). Please stop by and give Sally and her team your encouragement. They will also be a chance to find out more about the campaign and how you can help the cause.